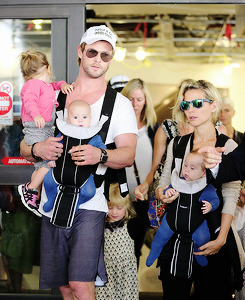 Chris and Elsa with their kids. . Wallpaper and background images in the Chris Hemsworth club tagged: photo rkebfan4ever chris hemsworth. This Chris Hemsworth photo contains sonnenbrille, dunkle brille, schatten, sonnenbrillen, dunkle brillen, and schattierungen. That's a great pic, Cheri :) Those boys are so cute!